Crocs comfort Level 1. The Sloane Graphic Etched Slide is high stylin~ and profilin~! Synthetic upper features graphic etched details for added appeal. Easy slip-on style. Iconic Crocs Comfort: soft and supportive. Lightweight EVA outsole. Imported. Measurements: Weight: 5 oz Product measurements were taken using size 9, width M. Please note that measurements may vary by size. Weight of footwear is based on a single item, not a pair. Crocs comfort Level 1. 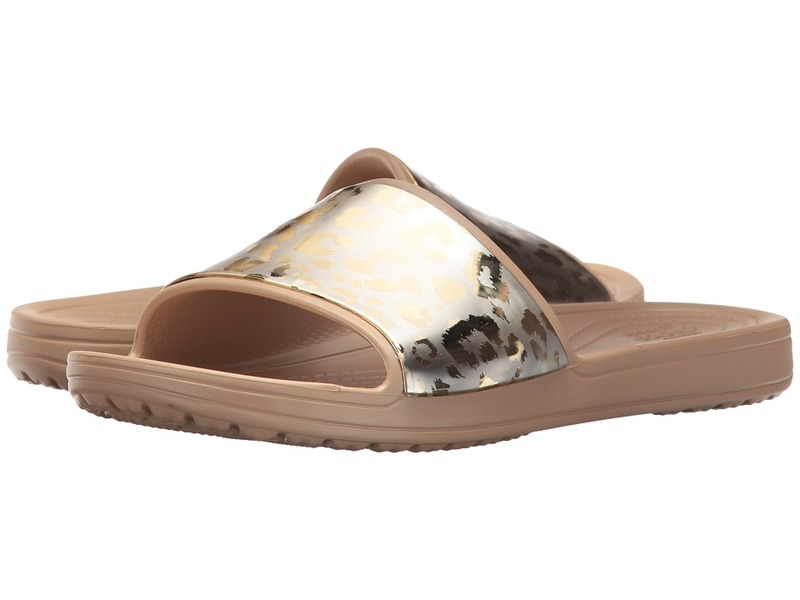 The Sloane Graphic Metallic Slide is high stylin~ and profilin~! Synthetic upper features diamante styling with a fun graphic that makes them easy to dress up or down. Easy slip-on style. Iconic Crocs Comfort: soft and supportive. Lightweight EVA outsole. Imported. Measurements: Weight: 5 oz Product measurements were taken using size 9, width M. Please note that measurements may vary by size. Weight of footwear is based on a single item, not a pair. Crocs comfort Level 1. The Sloane Hammered Metallic Flip is high stylin~ and profilin~! Synthetic upper features diamante styling that makes them easy to dress up or down. The embellishments are molded into the design so they won~t ever fall off. Easy slip-on style. 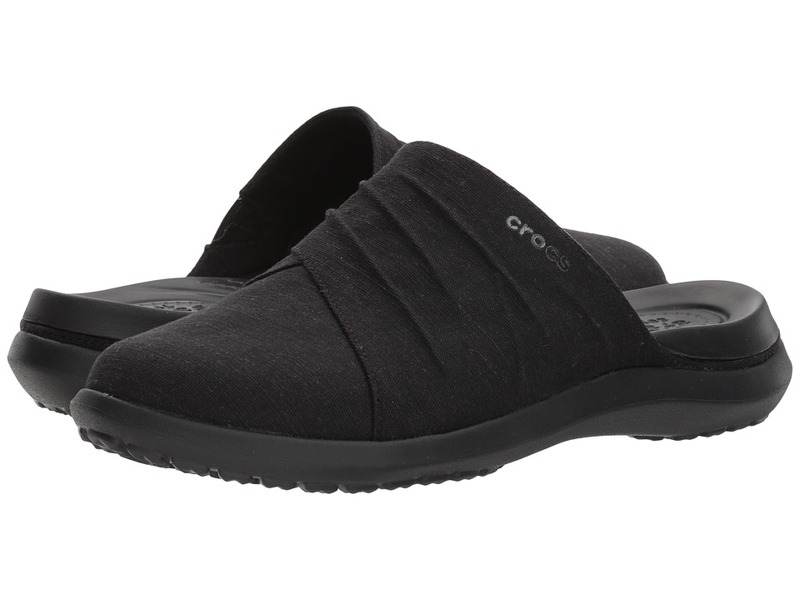 The original Croslite footbed is ultra-cushy and extra soft for all-day comfort and support. Croslite outsole. Imported. Measurements: Weight: 4 oz Product measurements were taken using size 8, width M. Please note that measurements may vary by size. Weight of footwear is based on a single item, not a pair. Crocs comfort Level 1. 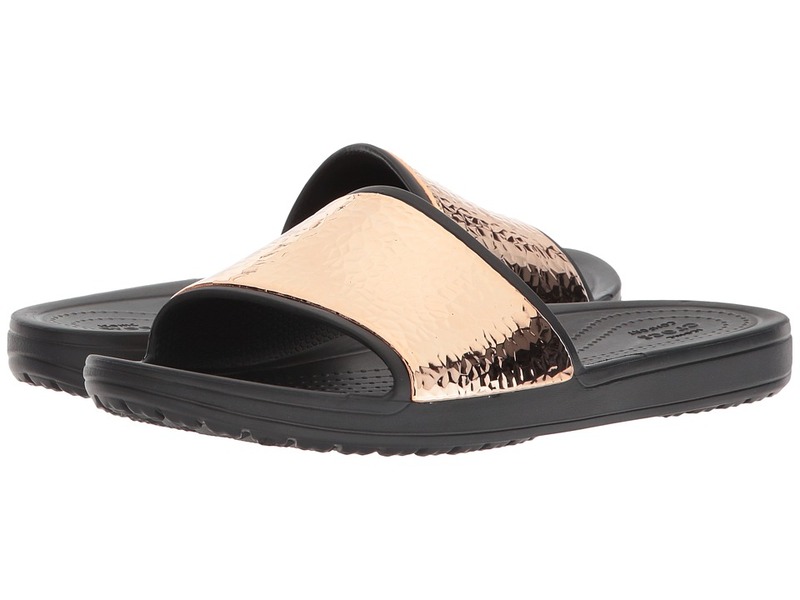 The Sloane Hammered Metallic Slide is high stylin~ and profilin~! Synthetic upper features diamante styling that makes them easy to dress up or down. The embellishments are molded into the design so they won~t ever fall off. Easy slip-on style. Iconic Crocs Comfort: soft and supportive. Lightweight EVA outsole. Imported. Measurements: Weight: 4 oz Product measurements were taken using size 8, width M. Please note that measurements may vary by size. Weight of footwear is based on a single item, not a pair. Crocs comfort Level 2. 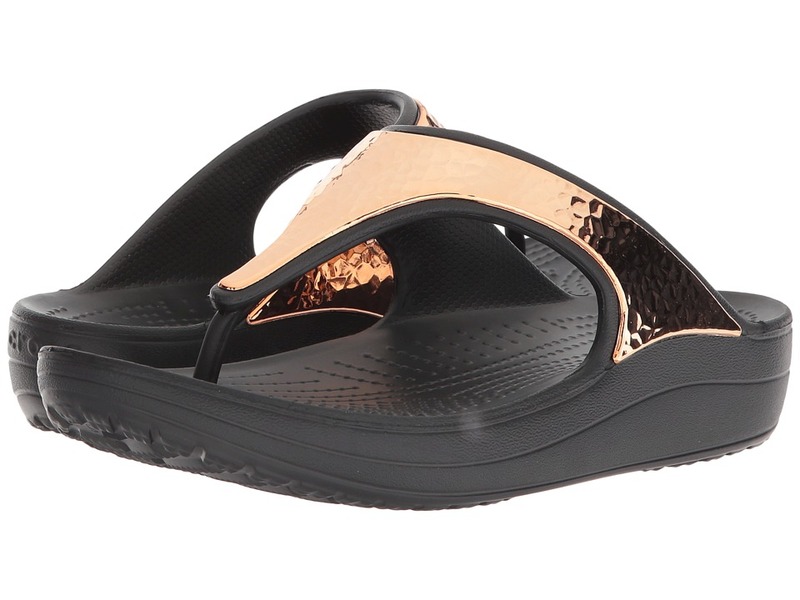 Get all glammed up with Crocs in the charming Sanrah Hammered Metallic Sandal. Synthetic upper features a metallic embellishment at the vamp for added appeal. Easy slip-on style. Deep cushion: Feels soft with all-day support. Lightweight EVA outsole. Imported. Measurements: Heel Height: 1 1 4 in Weight: 4 oz Product measurements were taken using size 9, width M. Please note that measurements may vary by size. Weight of footwear is based on a single item, not a pair. Go boldly into the summer with the essential Crocs Isabella Gladiator Graphic Sandal! Stylish floral graphics adorn upper. Soft, flexible Gemlite straps. Original Croslite foam cushion for all-day comfort. Rubber outsole for durable wear. Imported. Measurements: Heel Height: 3 4 in Weight: 5 oz Product measurements were taken using size 8, width M. Please note that measurements may vary by size. Weight of footwear is based on a single item, not a pair. Crocs comfort Level 1. 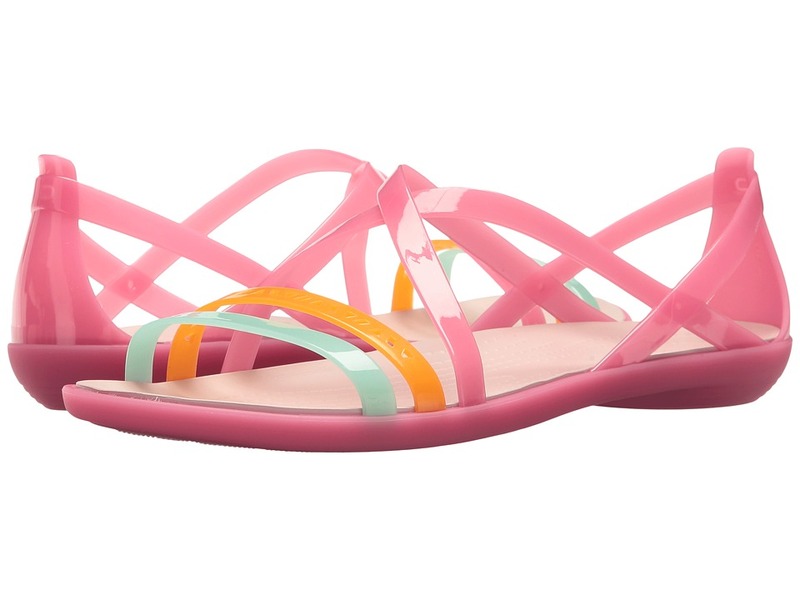 The Isabella Cut Strappy Sandal is a flashy little slip-on for warm-weather outings! Thermoplastic (EVA) upper in a strappy design. Easy slip-on style. Iconic Crocs Comfort: the original foam cushion you love. Lightweight EVA outsole. Imported. Measurements: Heel Height: 1 in Weight: 5 oz Product measurements were taken using size 9, width M. Please note that measurements may vary by size. Weight of footwear is based on a single item, not a pair. Crocs comfort Level 1. 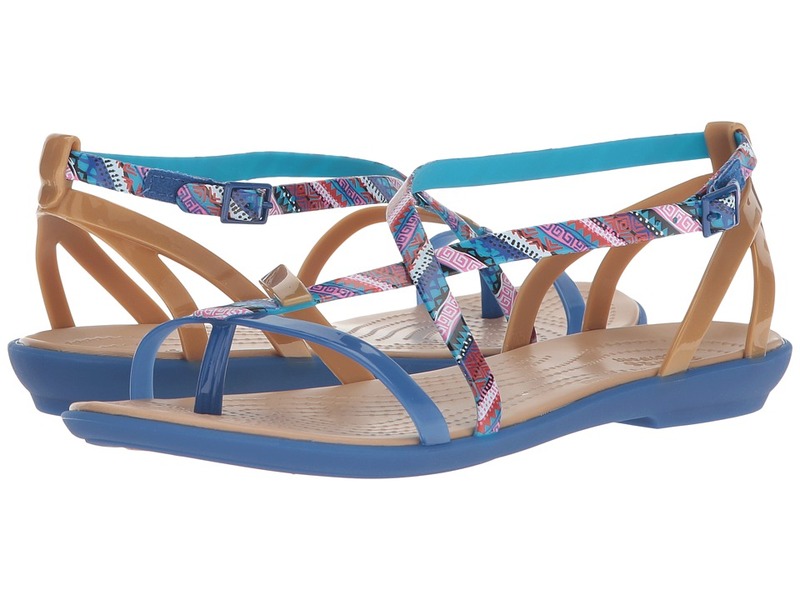 Slip right into vacation mode with the Isabella Cut Graphic Strappy Sandal. Thermoplastic (EVA) upper in a strappy design. Easy slip-on style. Iconic Crocs Comfort: the original foam cushion you love. Lightweight EVA outsole. Imported. Measurements: Heel Height: 3 4 in Weight: 5 oz Product measurements were taken using size 8, width M. Please note that measurements may vary by size. Weight of footwear is based on a single item, not a pair. Crocs comfort Level 1. 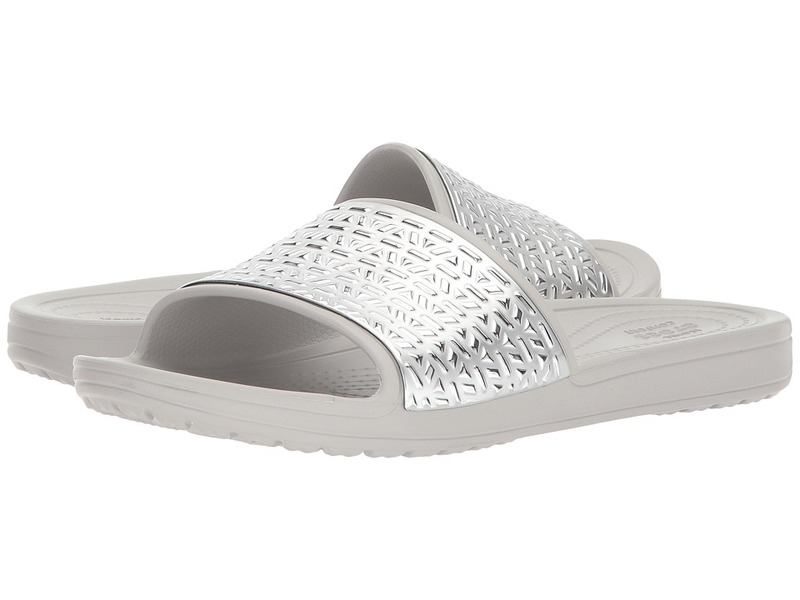 Spice things up with the eye-catching CitiLane Roka Metallic Slip-On from Crocs. Breathable metallic TPU perforated upper for added fun. Slip-on construction with twin gore stretch panels for easy on and off. Original Croslite&amp#8482 footbed is ultra-cushy and extra soft for all-day comfort and support. Slip-resistant and non-marking outsole delivers sure footing on a variety of surfaces. Imported. Measurements: Weight: 6 oz Product measurements were taken using size 8, width M. Please note that measurements may vary by size. Weight of footwear is based on a single item, not a pair. Crocs comfort Level 2. The Leigh Ann Shimmer Slingback Wedge will take you just about anywhere your little heart desires! Cotton and polyester upper features a shimmer effect for added appeal. Easy slip-on style with goring for a comfortable fit. Soft microfiber lining. Deep cushion: Feels soft with all-day support. Rubber and TP wedge and outsole. Imported. Measurements: Heel Height: 2 1 4 in Weight: 7 oz Product measurements were taken using size 8, width M. Please note that measurements may vary by size. Weight of footwear is based on a single item, not a pair. Crocs comfort Level 2. 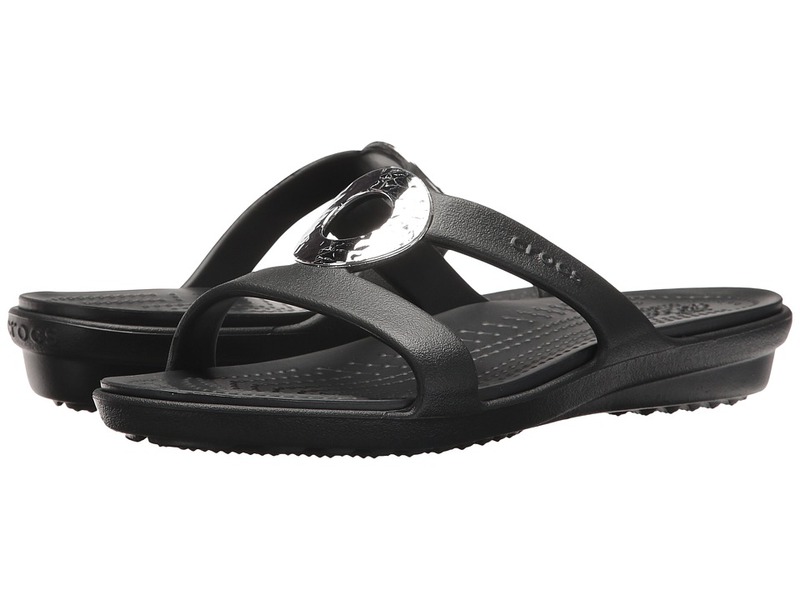 Carefree days are ahead with the Crocs Capri Mule! Textile uppers with slouch-wrap styling. Easy slip-on style. Deep heel cup cradles the foot. Deep cushion: Feels soft with all-day support. TR (EVA) outsole for a pleasurable walking experience. Imported. Measurements: Weight: 6 oz Product measurements were taken using size 9, width M. Please note that measurements may vary by size. Weight of footwear is based on a single item, not a pair. Crocs comfort Level 1. 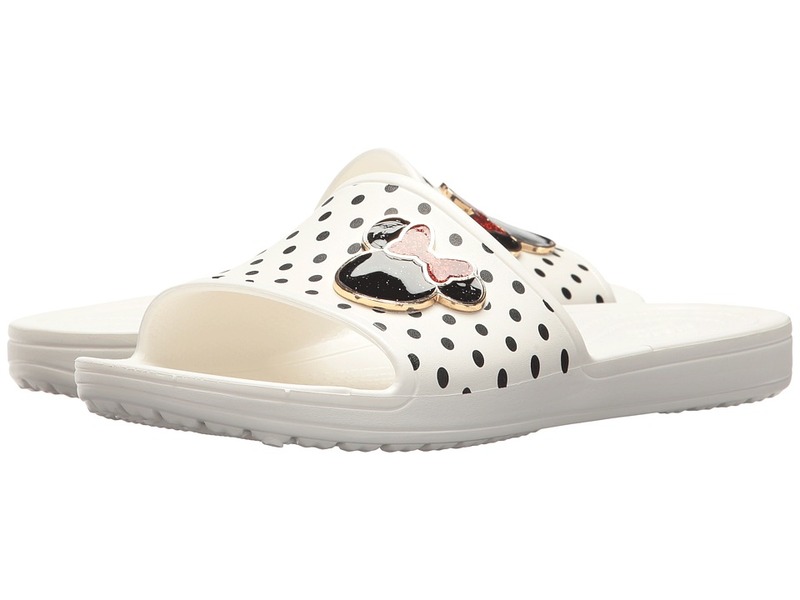 Hit the streets with Disney~s very own Minnie Mouse in these adorable slip-on shoes from Crocs! 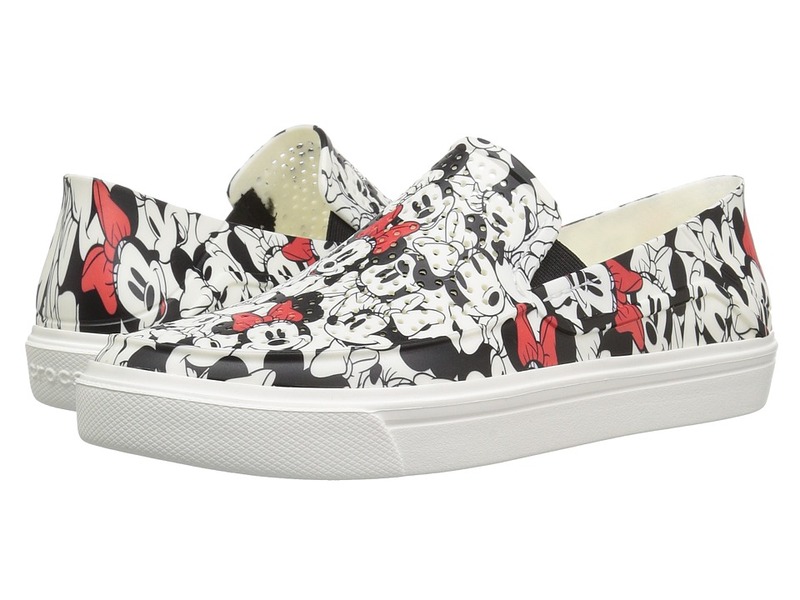 Breathable TPU perforated upper features Minni Mouse graphics for added fun. Slip-on construction with twin gore stretch panels for easy on and off. Original Croslite&amp#8482 footbed is ultra-cushy and extra soft for all-day comfort and support. Slip-resistant and non-marking outsole delivers sure footing on a variety of surfaces. Imported. Measurements: Weight: 6 oz Product measurements were taken using size 8, width M. Please note that measurements may vary by size. Weight of footwear is based on a single item, not a pair. Crocs comfort Level 1. 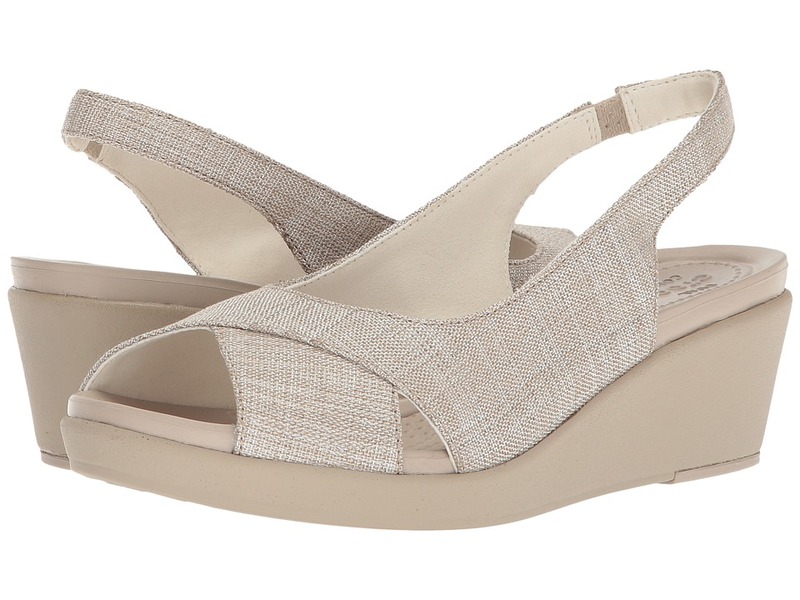 Style it up in this simple yet darling slide. Synthetic upper features polka dot detailing embellished with a Minnie decoration for added fun. Easy slip-on style. 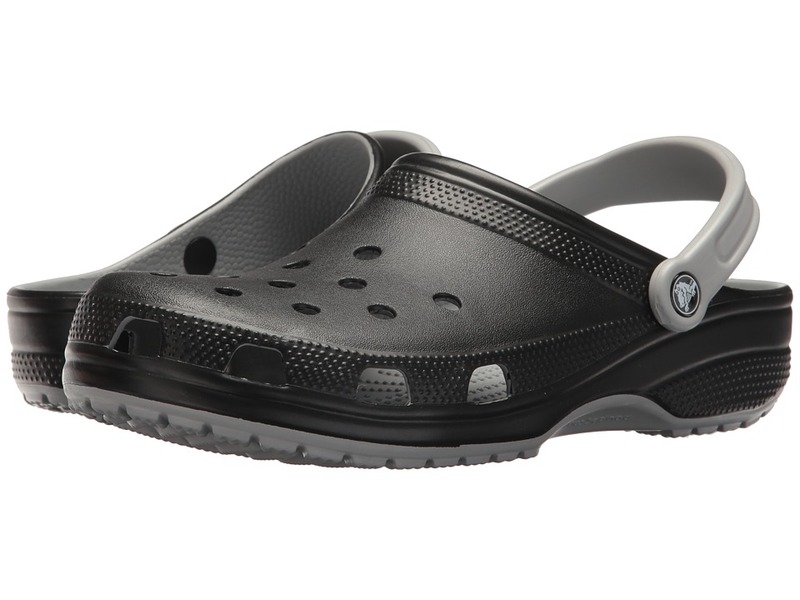 Crocs footbed is ultra-cushy and extra soft for all-day comfort and support. TR (EVA) outsole. Imported. Measurements: Weight: 5 oz Product measurements were taken using size 9, width M. Please note that measurements may vary by size. Weight of footwear is based on a single item, not a pair. Crocs comfort Level 1. 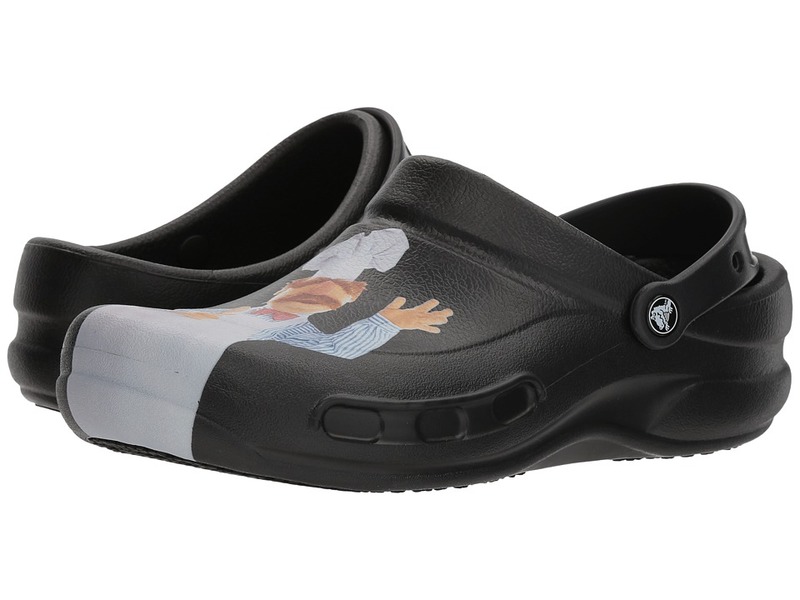 Keep calm while the lunch rush heads in with the Bistro Swedish Chef Clog from Crocs. Thermoplastic (EVA) upper features a chef character graphic for added fun. Heel strap for a more secure fit. Enclosed toe design and thicker metatarsal area help protect the foot from spills. Iconic Crocs Comfort: original Crocs foam cushion feels soft with all-day support. Crocs Lock slip-resistant tread. Easy to clean with soap and water. Imported. ASTM F2913-11 tested, CE Certified. Meets or exceeds EN ISO 20347:2012, OB, SRC. Measurements: Weight: 10 oz Product measurements were taken using size Men~s 11, Women~s 13, width Medium. Please note that measurements may vary by size. Weight of footwear is based on a single item, not a pair. Crocs comfort Level 1. 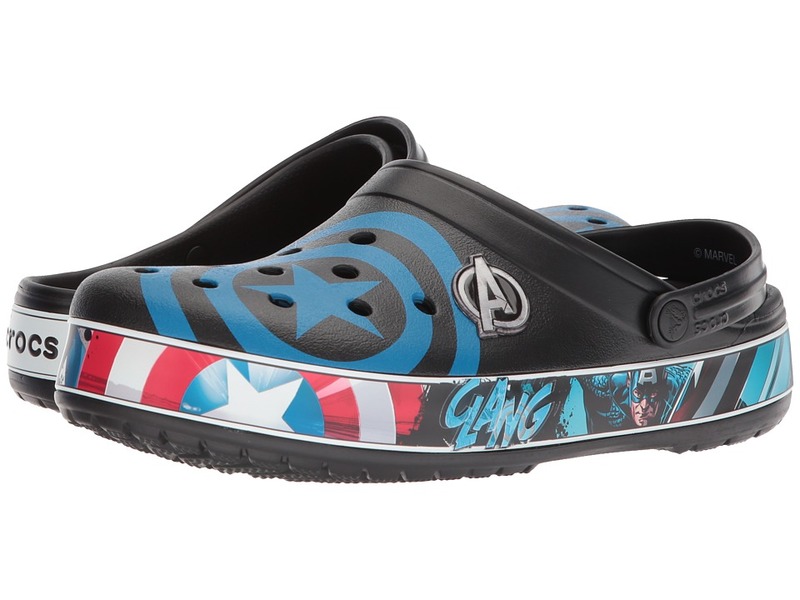 Save the day one stride at a time with the famous Crocband Captain America Clog! Thermoplastic (EVA) upper features Captain America graphics. Ventilation ports. Foam cushion footbed: Feels soft with all-day support. Non-marking lightweight outsole. Imported. Measurements: Weight: 9 oz Product measurements were taken using size Men~s 12, Women~s 14, width Medium. Please note that measurements may vary by size. Weight of footwear is based on a single item, not a pair. Crocs comfort Level 1. 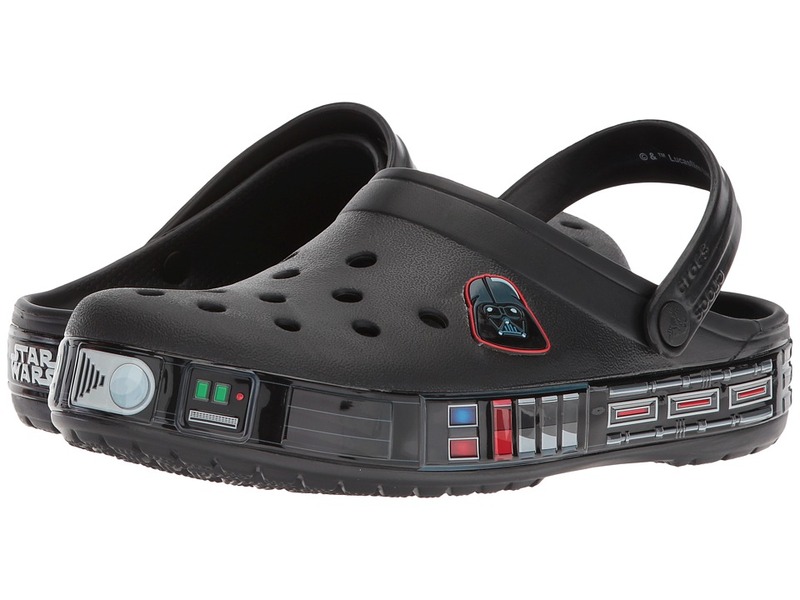 Feel the power Darth Vader holds in this galactic clog from Crocs! Croslite upper features Star Wars graphics. Ventilation ports. Original Croslite foam cushion: Feels soft with all-day support. Non-marking lightweight outsole. Imported. Measurements: Weight: 7 oz Product measurements were taken using size Men~s 8, Women~s 10, width Medium. Please note that measurements may vary by size. Weight of footwear is based on a single item, not a pair. Slip into cozy comfort with the Classic Carbon Graphic Clog! Thermoplastic (EVA) foam construction makes them incredibly light. Easy slip-on with adjustable back strap. Extra roomy for a comfortable fit. Ventilation system that allows air and water to pass through multiple ports inside of shoe. Original foam-cushioned footbed. Thermoplastic (EVA) outsole. Imported. Measurements: Weight: 7 oz Product measurements were taken using size Men~s 11, Women~s 13, width Medium. Please note that measurements may vary by size. Weight of footwear is based on a single item, not a pair. Crocs comfort Level 1. 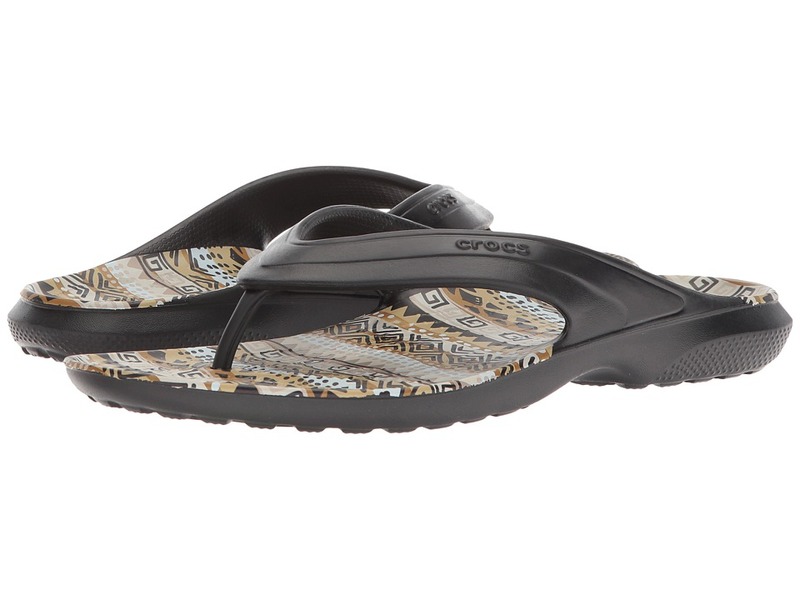 Enjoy the cozy comfort of the Classic Graphic Flip from Crocs. Synthetic upper. Easy slip-on style with flexible straps for a comfortable wearing experience. Incredibly light, sleek, and a slim fit. Original Croslite foam cushion: Feels soft with all-day support. EVA outsole. Imported. Measurements: Weight: 5 oz Product measurements were taken using size Men~s 12, Women~s 14, width Medium. Please note that measurements may vary by size. Weight of footwear is based on a single item, not a pair.